Download a blank fillable Dd Form 2753 - Nsep Service Agreement Report For Scholarship And Fellowship Awards in PDF format just by clicking the "DOWNLOAD PDF" button. 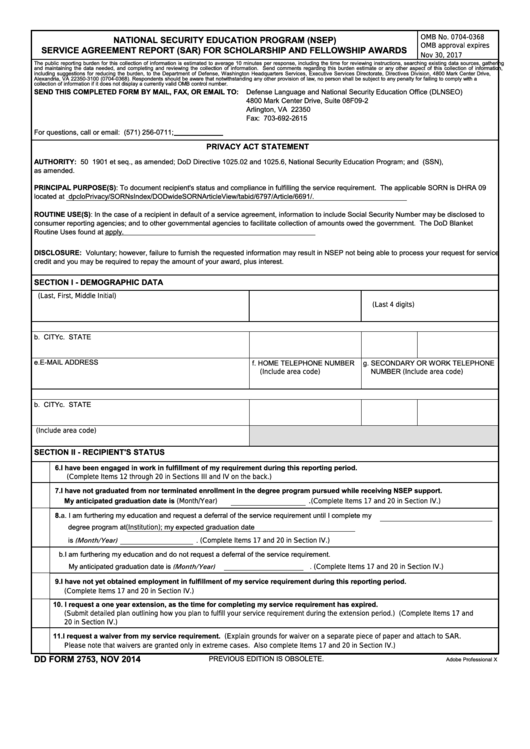 Complete Dd Form 2753 - Nsep Service Agreement Report For Scholarship And Fellowship Awards with your personal data - all interactive fields are highlighted in places where you should type, access drop-down lists or select multiple-choice options. Routine Uses found at also apply. credit and you may be required to repay the amount of your award, plus interest. 6. I have been engaged in work in fulfillment of my requirement during this reporting period. 7. I have not graduated from nor terminated enrollment in the degree program pursued while receiving NSEP support. b. I am furthering my education and do not request a deferral of the service requirement. 9. I have not yet obtained employment in fulfillment of my service requirement during this reporting period. 10. I request a one year extension, as the time for completing my service requirement has expired. 11. I request a waiver from my service requirement. (Explain grounds for waiver on a separate piece of paper and attach to SAR.